I’ve had a stomach bug since the weekend and today was the first time I felt safe to move more than a few steps away from the bathroom. I haven’t done any gardening since Saturday afternoon and had to cancel a gig on Sunday, which I hate doing. But I’m definitely on the mend, as I got into “making mode” this afternoon. Most of Tasmania has been wreathed in smoke for the last few days and that in itself makes me a little restless. As I write, it’s hazy in Hobart and there’s a distinct smell of bush smoke through the open window. There are at present, approximately 80 fires burning across Tasmania, mostly started by lightning strikes last week on the less populated west coast. Nevertheless, this afternoon, it spread up into the north west, putting property, livestock and potentially lives at risk. My thoughts and best wishes go out, not only to friends who live in the areas affected, but also to state fire services, who are pretty much at their limit right now. Yesterday, my lovely neighbour traded a box of lemons from her boss for a dozen of my eggs – I love bartering! After moping around the house yesterday, I decided to get creating some healthy lemon-based goodies that wouldn’t be too harsh on my tender tummy right now and pickles that will be ready in the months ahead. 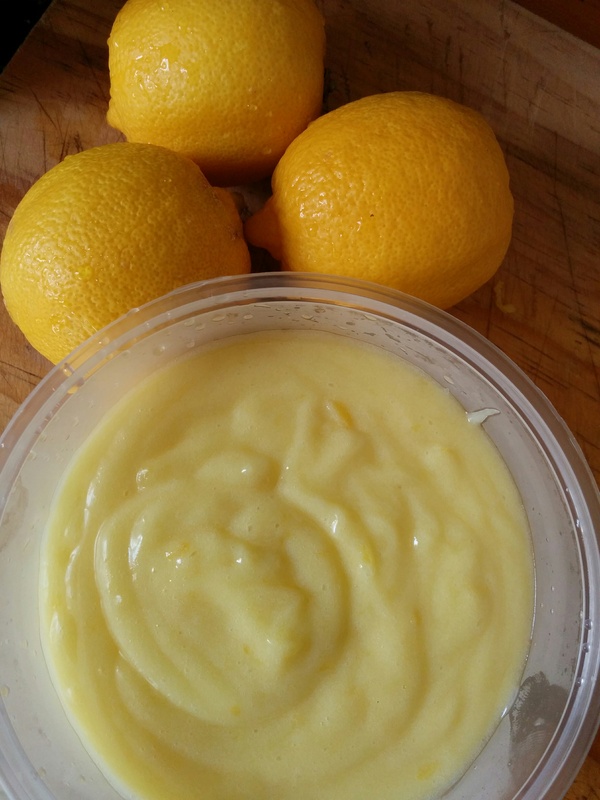 First, I decided I needed the sweet, comforting tang of old fashioned Lemon Curd, something I haven’t made in years. This versatile cream doesn’t keep very long but I understand it freezes quite well so I’ve got half (about 250 ml) in a plastic container, ready to freeze. The recipe is very simple. In a heat proof bowl, whisk the eggs and sugar over a simmering pot of water. When the sugar is dissolved, add the lemon zest, juice and continue whisking until the mixture becomes creamy. Add the cubed butter and continue mixing until it’s thoroughly absorbed. This tangy delight is wonderful as a base for lemon mousse, spread over a pie base for simple lemon tart, mixed with whipped cream and a little home made yogurt for Lemon Fool or just used as spread on toast. Tonight, I’m having it on pancakes as a treat. The other thing I made was another jar of Pickled Lemons. I don’t think you can ever have too many jars or variations of this most wonderful condiment. For this batch I reverted back to my old recipe I’ve been making for nearly 30 years. Measurements are fairly arbitrary – it depends on how big a jar you’ve got handy and how many lemons you want (or need) to pickle! Also, experiment with adding different spices throughout the jar. I particularly like bay leaves and chillies – something I’ve got plenty of at the moment. Start with a scrupulously clean jar, preferably a sterilised preserving jar. I used one with a swing top lid and a good rubber seal. Put a tablespoon of salt in the bottom of the jar and a little of the spices and put it to one side while preparing the lemons. Wash the lemons in plain hot water and remove any diseased fruit, stem pieces and cut out any blemishes that might spoil the finished pickles. 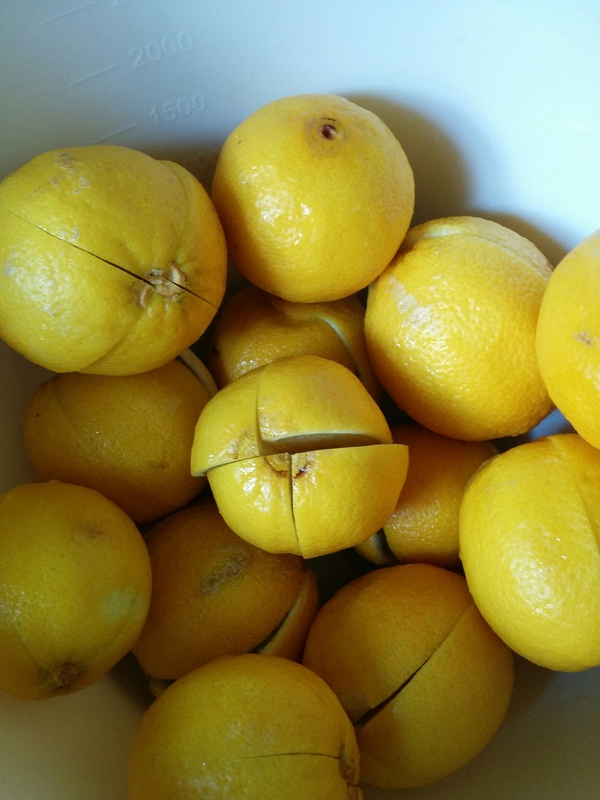 With a sharp paring knife carefully quarter each lemon almost to the base. (See the photo above). I recommend cutting them over a bowl to catch any juice that can be poured over the finished pickle. Put a generous spoon of salt into each cut. Again, do this over the bowl, it can get a bit messy! 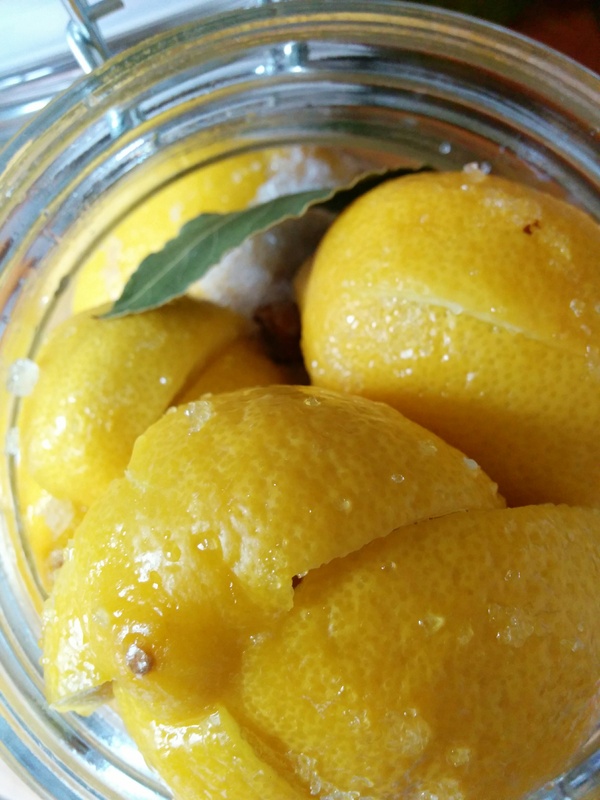 Now, put the salted lemons into the jar, layering with more salt and any spices you want to use. In this jar I used a cinnamon quill broken into pieces, a few bay leaves and two fresh cayenne chillies that I poked a few holes in to let the lemon juice and salt in. Use a wooden spoon (even the handle) to really cram the lemons in and release their juice. This, combined with the salt preserves the fruit. Close the lid and leave the jar on a shelf for a month, shaking it every day. Use a little as a condiment with curries, chopped up very fine in marinades or stuffing and in recipes such as Lemon Chicken. Preserving salt is also called pickling salt – don’t feel silly! It’s pure sodium chloride without the extra compounds that table salt has to stop it clumping or iodine. I’ve used cooking salt and even table salt when I haven’t had anything else.